Despite representing different stages of human evolution, it looks like European Homo Sapiens might have had a penchant for a little Neanderthal booty. Or vice versa. Two new studies show that humans and Neanderthals overlapped by about 5,000 years in Europe, and, like, hung out, if you know what I mean. Scientists re-analyzed two teeth and a jaw bone using CT scans to reach the conclusion. In the '60s, scientists believed the remains came from Neanderthals. But two new analyses published in Nature show that they are actually human. 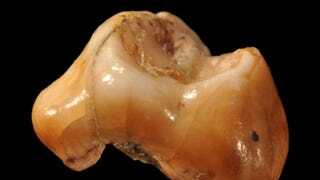 The teeth place the earliest known European Homo sapiens in a cave in Italy 45,000 years ago. The jaw suggests other modern humans existed in what's now the United Kingdom 44,000 years ago. The scientists say humans quickly made their way across Europe. Neanderthals existed until about 40,000 years ago, which would mean an approximately 5,000-year overlap and raises the possibility that some, ahem, *relations* between with ancient and modern humans occurred. An analysis of the Neanderthal genome last year found that up to 4 percent of our modern human DNA is made up of Neanderthal DNA, strongly suggesting that the two had mated probably in the Middle East. Now it looks like that may have happened even more recently in Europe as well. Those charming Neanderthals, who could resist?